Has bold-looking Red Bull repeated its 2017 mistake? Last year Red Bull's much-anticipated Formula 1 challenger was a little underwhelming in launch trim. Its successor's bold special livery has turned heads, but is it also disguising an unspectacular design beneath? 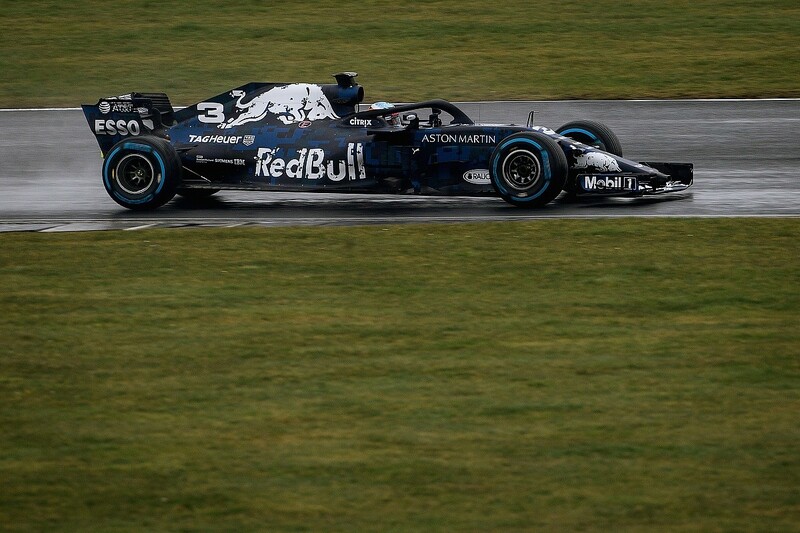 To have any chance of winning the world championship this year, Red Bull must start the Formula 1 season strongly. It threw away 2017 with both its initial performance and its poor later-season reliability problems, but on the positive side proved it has the infrastructure to overcome these problems. The trouble is, the others don't sit around and wait. Daniel Ricciardo and Max Verstappen are both ready to put up a championship challenge, but they need the tools to do the job. With Renault suggesting last year it will not be supplying Red Bull with power units in 2019, this might be their last opportunity for a while. 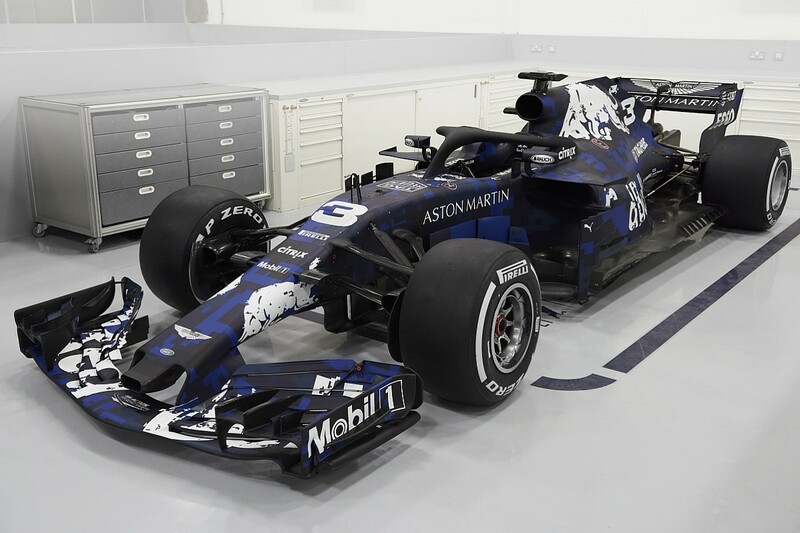 While he was tinkering with various other projects this time last season, I'm pretty sure technical chief Adrian Newey will have been fully focused on Red Bull's 2018 car right from the get-go. We expected a lot from one of the most highly rated aerodynamicists for the start of 2017 but it wasn't there. So will '18 reverse that situation? Let's have a look. It's always difficult to see things in detail when a team puts a lot of effort into camouflaging the initial car. Perhaps this is something Red Bull has learned from new partner Aston Martin. 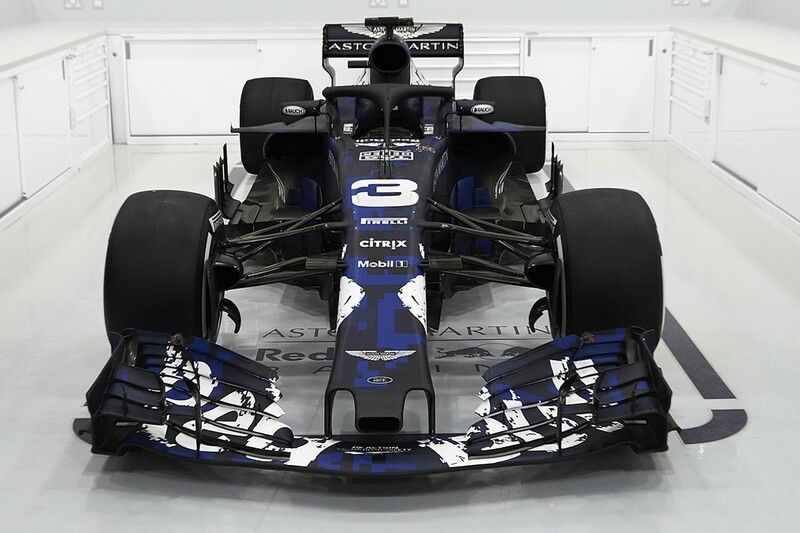 The front wing assembly is the customary multi-element component, but with a more uniform slot-gap placement than we have seen on the other cars. By that I mean the chord lengths of each component from the leading edge to trailing edge are more parallel. These slot gaps are all there to control the airflow separation and, more importantly, allow recovery from any separation problems. The more control you have over this, the more consistent the aerodynamic loads from the front wing assembly. Also, any turbulence coming off the trailing edge of the front wing due to airflow separation will have a detrimental effect further downstream. Red Bull also has an S-duct with the entry under the nose and the exit halfway up Ricciardo's number '3'. This S-duct helps pull airflow across the FIA-defined neutral central wing section, improving the mass airflow to the bargeboard area. It also reduces the lift created on the top of the chassis by the airflow accelerating over the top surface. Red Bull has also retained its 'driver cooling duct' in the front of the nose. This helps with the stagnation point of the airflow on the leading edge of the nose. The stagnation point is where the airflow decides whether it is going to go over the top of the nose or underneath it. Behind the front wheels, things get a bit more distinctive. The initial bargeboard package is a large vertical three-element component with a horizontal outer vane holding them all together. The car also has a curved lower foot area helping to better prepare the airflow for the underfloor. All of these are to pull more mass airflow through from under the front of the chassis helping the performance of the front wing and the leading edge of the underfloor. The outer bargeboard area is a vertical four-element component mounted as wide as possible on the outer corner of the sidepods. This area is all about managing the turbulent airflow coming off the trailing edge of the front tyre and trying to keep it away from the leading edge of the sidepod and underfloor. As opposed to last year's Ferrari, which had a very high letterbox style radiator inlet, Red Bull has gone for a narrower and taller inlet. The leading edge of the sidepod has the customary lower undercut, but it is not as pronounced as the other cars we have seen and this undercut doesn't continue through the sidepod. Instead, Red Bull has gone for a very narrow overall sidepod section angled inwards from the floor to the top. This will entice the airflow coming over the top of the car to be pulled down into the Coke bottle area inside in rear tyres. There is also a horizontal wing section developing out of the top leading edge of the sidepod, which goes out to the maximum width of the car. This profile twists downwards with a small endplate on the upper surface. This component is also helping the airflow to sweep down into the Coke bottle area. The Coke bottle area and the rear body section is fairly run of the mill, with the radiator exits being a T-section at around top rear wishbone height. Again, this not as exaggerated as we have seen on other cars. Red Bull continues to run the car with a very high rear ride height, which we call rake. This improves the performance of the front wing at low speeds when the rear is high and the front low - then it tapers off as the rear gets closer to the ground at higher speeds. It also means that the rear diffuser doesn't stall as early, again helping to move the centre of pressure rearwards as the car increases speed. 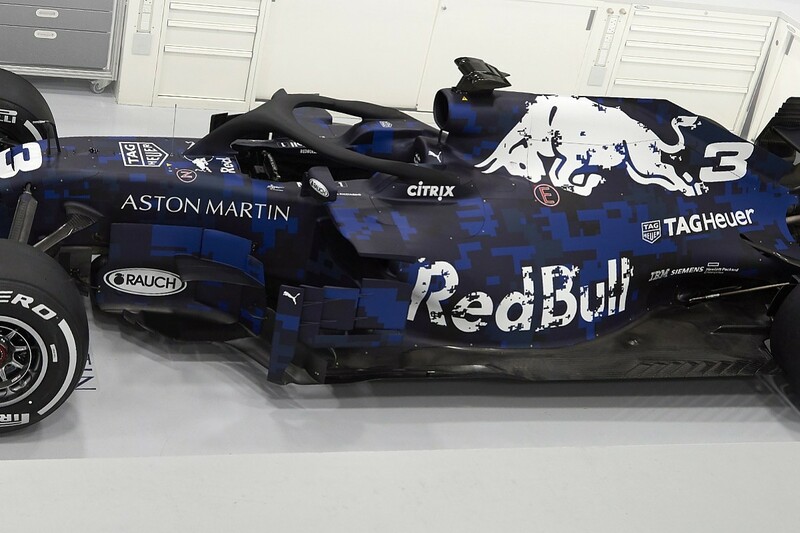 We must wait until the Barcelona test to see the rear of the car in detail, and as the diffuser is one of the dominant components that makes up the aerodynamic package it will be interesting to see what Red Bull has come up with there. Last year at the first pre-season test, I said I didn't see the 'wow' factor with the Red Bull, and I have to say I also expected more this year. The car again has all the necessary bits and pieces but there is no stand-out component optimisation that I can see. As I said above, Red Bull needs to start the season strongly if it is to have a chance at another championship. And from the chassis, it might just need more than what we see here to achieve that. The other worrying factor for Red Bull is where the 2018 Renault engine package is at. It needs to be a lot more reliable at higher performance levels and Renault must unlock more one-lap power, especially in qualifying, to challenge Mercedes and Ferrari consistently. Renault has struggled throughout the V6 hybrid regulations and I'm pretty sure Red Bull will be expecting a lot more from it in 2018.